Photograph courtesy Kevin Hughes. 5149 at Helwith Bridge working a local freight over the Settle & Carlisle on March 12th 1969. The eleven year nine month career of D5149 was spent allocated to Eastern Region & Scottish Region depots. After withdrawal 5149 was moved to Glasgow Works, being noted there during February 1973. The locomotive was scrapped between April 1973 & November 1973. Noted Darlington Works October, November 1961 & January, February 1962 (Collision, one continuous stay?). Noted Darlington Works October - December 1963. 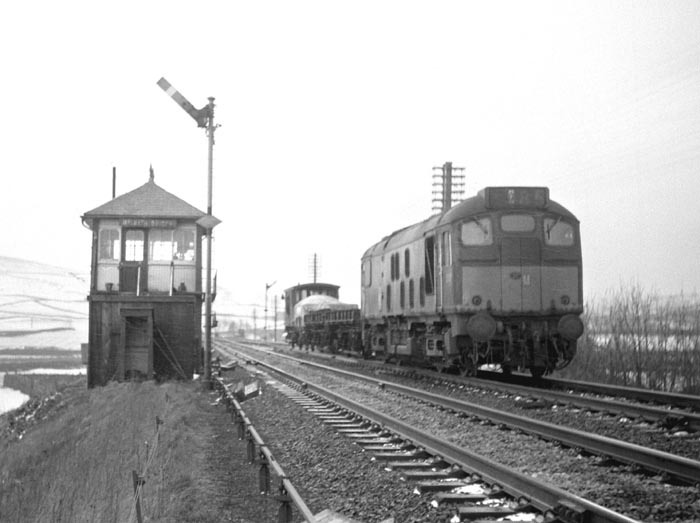 Noted Darlington Works February 1964. Noted Derby Works September & October 1966. The completion of D5147 - D5150 closed out the order books for the BR/Sulzer Type 2s powered by the 1,160hp 6LDA28A engine, D5149 was delivered to Gateshead during February 1961. These locomotives were boiler equipped, so found themselves diagrammed for both passenger and freight work in the Newcastle area, including the principal routes to Edinburgh, Carlisle & York. D5149 was noted at Darlington Works during October with collision damage, remaining here until at least February 1962. D5149 was noted at Darlington Works from October 1963 to February 1964. In the course of berthing its train off a Newcastle - York service on June 15th D5149 propelled the stock into an approaching Scarborough - Leeds diesel multiple unit at the north end of York station! The slow speed collision derailed both vehicles involved, with the diesel multiple unit suffering damage to the driving cab, the front part of the passenger compartment and underframe. Condition August: green livery with small yellow warning panels, squared upper corners, shortened fuel & water tanks, blanking plates fitted, hand/footholds present, ridge sided sandboxes, three-rung bogie mounted footsteps, most valencing still in place, steam style shedplate on cabfront. D5149 visited Derby during September & October. Condition May: green livery with small yellow warning panels, squared upper corners, shortened fuel & water tanks, blanking plates fitted, hand/footholds present, ridge sided sandboxes, three-rung bogie mounted footsteps, most valencing still in place, engine exhaust in original position, steam style shedplate on cabfront, . During 1967 double headed Gateshead Type 2s were again diagrammed to work the Saturday’s only Newcastle - Ayr - Stranraer passenger in both directions. So noted in June & July were D5097/5112 (24th), 5149/5112 (1st), 7601/5149 (8th), 7611/5051 (15th) & D5101/5112 (22nd), Scottish examples filled in, especially on the eastbound runs after failures had occurred. These workings must be considered one of the more interesting service/routes worked by the Class 24s, regretably there seems to be little photographic record of these workings. After calling Gateshead home for seven years 5147 - 5150 were allocated to Leeds Holbeck (55A) during September. A treat for 5149 on September 19th was to take charge of a two coach special conveying ER Board members on an official visit to Lynemouth Colliery. The special ran from Newcastle and involved the use of NCB rails between Woodhorn & Lynemouth. Photograph courtesy Kevin Hughes. 5149 at Horton in Ribblesdale working a local freight over the Settle & Carlisle on March 12th 1969. Condition summer (no month): green livery with small yellow warning panels, squared upper corners, warning panel covers frame level stripe, shortened fuel & water tanks, blanking plates fitted, hand/footholds present, straight sided sandboxes, three-rung bogie mounted footsteps, most valencing still in place, steam style shedplate on cabfront. As part of the reshuffling of the fleet in October 5147 - 5150 moved to the Scottish Region to assist in the withdrawal of the remaining NBL & Clayton products. 5147 & 5148 moved to Polmadie (66A) whilst 5149 & 5150 moved to Eastfield (65A). On September 20th 5149 caught fire on an Auchinleck - Killoch colliery coal train, it was quickly moved to Glasgow Works but was condemned during October, other ScR Class 24s withdrawn that month were 5067/68, & 5114. On May 12th Glasgow Works held its first Open Day, remarkably there were sixty four diesels on display that day, although twenty seven of those were condemned Claytons. 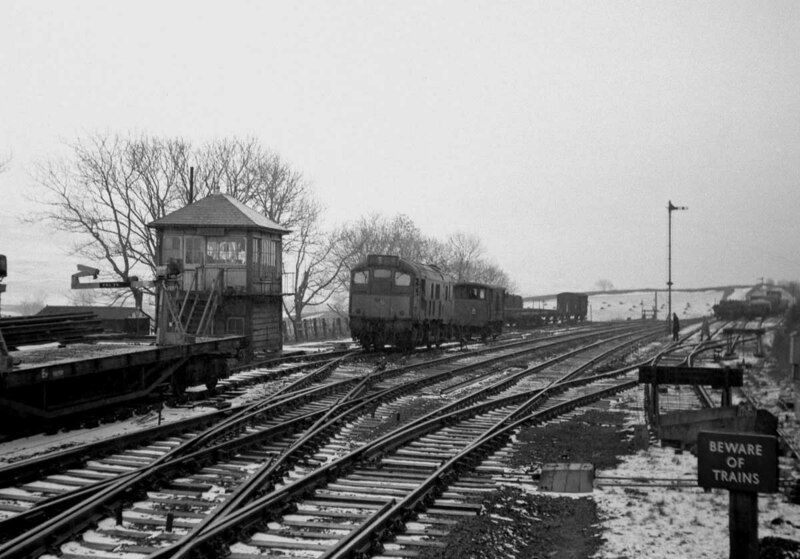 Two class 25s were present, 5178 and 5157, the latter having a replacement cab fitted from withdrawn 5149. The remains of 5149 would finally be disposed of during November.